Portillon Glacier is in the Luchon-Bagneres region of the French Pyrenees, just north of the border with Spain. This currently small, and becoming smaller glacier drains into Lac du Portillon, which has a dam impounding it for hydroelectric generation. Like the nearby Aneto Glacier, Portillon Glacier has been thinning, retreating and separating. First a comparison of photographs from 1900 and 2013. 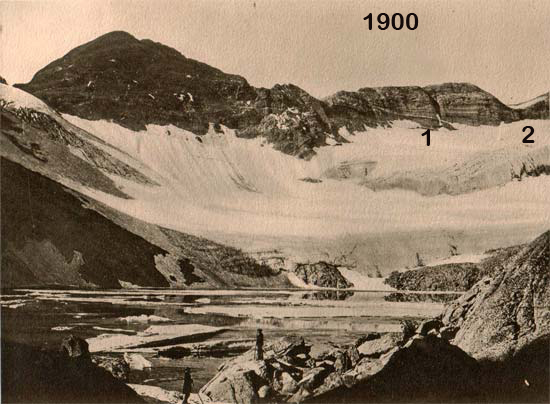 In 1900 the glacier fills most of the cirque and nearly reaches the shore of the lake. The lake level is lower at this time also. By 2013 the glacier occupies a few small niches near the head of the cirque. By 2006 Google Earth imagery indicates a glacier with an area of 0.12 square kilometers, red dots indicate the terminus of the glacier. Section 3 of the glacier has separated from the main section, 2. Section 1 is a narrow avalanche fed fringe beneath the cliffs. This section is too steep to retain good snow. 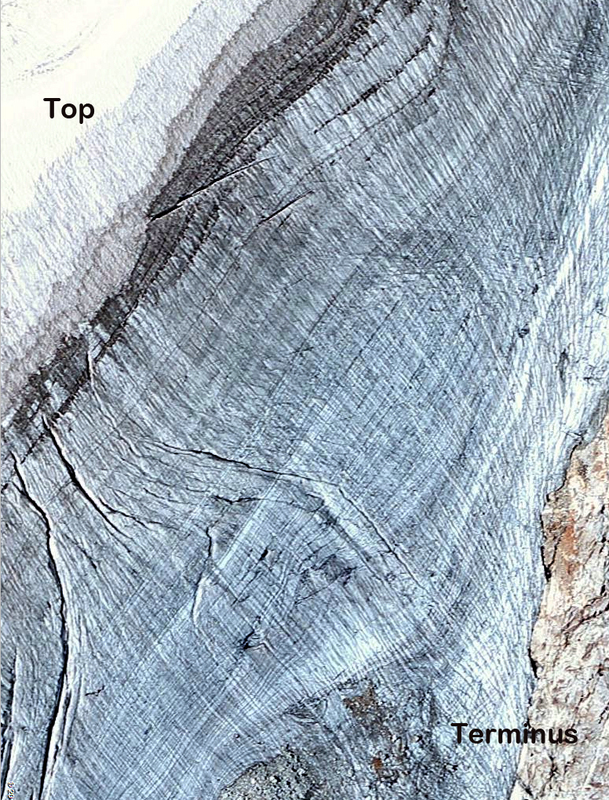 In the 2008 image The glacier also is notably thin with few crevasses, and several bedrock outcrops amidst the thinning ice. 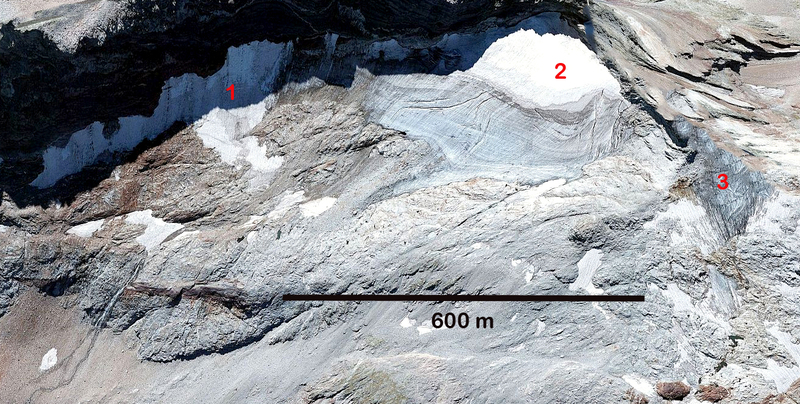 Both the 2006 and 2008 image indicate the lack of snowcover on the glacier. This has exposed up to 75 annual layers in a closeup transect from head to terminus of the glacier. There are only a few crevasses on this relatively steep glacier, indicating the lack of movement, which can only come from thin ice on a steep slope. The lack of persistent snowcover at the end of the melt season indicates a glacier,, like the Aneto and Maladeta Glacier, that will not survive current climate (Pelto, 2010). Its area is much less than Aneto Glacier, and it will disappear sooner. As SOER (2010) indicates more than 80% of the area of glaciers in the Pyrenees has been lost since the start of the 20th century. 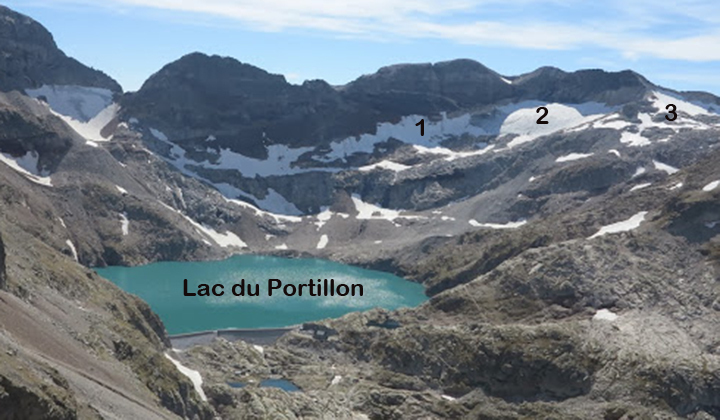 The color of Lac du Portillon and the loss of glacier in the basin reminds me of the Milk Lake Glacier, Washington that I watched disappear recently. This entry was posted in Glacier Observations and tagged france glacier disappearing, france glacier retreat, french glacier disappearing, French glacier retreat, Portillon glacier, portillon glacier retreat. Bookmark the permalink.